The primacy of Pakistan’s Supreme Court is because of that movement. There was a time when the SC would uphold the army coups as it did in the cases of General Ayub and General Zia-ul-Haq. A new interpretation to the constitution, the rule of “necessity,” was provided to give legitimacy to the coups. The court has now graduated to be a powerful entity so as to arraign even PM Gilani for contempt and indict him. The Supreme Court’s Chief Justice is the same Iftikhar Muhammad Chaudhry who suffered at the hands of the army because he dared to go against the wishes of then COAS General Pervez Musharraf. Justice Chaudhry was confined to one room, along with his family, for months and made to undergo more or less a solitary imprisonment. That in a country, where all other institutions are tottering, the emergence of the SC is indeed evoking hope for the future of democracy. Yet I have not been able to understand the logic of criticism that by strengthening the judiciary, the polity is weakening because such a process is at the expense of the power that the executive and parliament enjoy. For instance, the institutions in India have gained because of a series of judgments. The recent one, which Gilani’s lawyer Aitzaz Ahsan has quoted to defend the Pakistani prime minister, is the cancellation of 122 licences of allotment in the 2G spectrum (mobiles) scandal on the ground that PM Manmohan Singh did not know about the letters which his office (PMO) had received from the indicted former Telecom Minister A Raja. The blame was put on the officials and advisers. So has been the tenor of Aitzaz Ahsan’s arguments. In India, the judiciary has gone to the extent of laying down that parliament cannot change the basic structure of the constitution, meaning thereby, secularism, federalism and the parliamentary system. True, parliament represents the people but in the heat of the moment or any vociferous movement, parliament can be swayed by the mood in the country prevailing at a particular time. The same principle that the basic structure constitution cannot be violated holds good for Pakistan as well, even though its SC has not said so unequivocally. By kicking up the dust, the real issue of corruption cannot be obscured. President Zardari is said to have laundered billions of dollars and stashed in Swiss banks. The fact that then President General Musharraf condoned the crime through an ordinance (the NRO) does not mean that Zardari can appropriate the money which really belongs to the Pakistan exchequer. Gilani is only President Zardari’s face. He owes his office to him and therefore it was natural that he should take the responsibility for the president’s acts of omission and commission. Gilani’s defence that Zardari enjoys immunity under the constitution may be all right for legal purposes, although the SC would probe whether immunity is absolute or whether it can be questioned in any way. At least the SC can order that the money stashed abroad be brought back to Pakistan even if it “remains” in Zardari’s account. Immunity means that no action can be taken against Zardari since he is the president who enjoys such powers under the constitution. Yet immunity cannot be stretched to a point where Zardari is not directed to transfer back the stashed money to the Pakistani banks. Chief Justice Chaudhry was not lessening the stature of the executive by asking Gilani to write to the Swiss authorities to reopen the case of Zardari’s assets in banks in that country. That Gilani sits over the court’s order for more than two years is unacceptable. To characterise a case of corruption as an attack on government or, for that matter, parliament, is like missing the forest for the trees. The corrupt, however high in position, should be brought to book to revive people’s faith in democracy. Too many instances of graft in South Asian countries have disfigured democracy in the region. It is difficult to guess about the fate of Gilani’s trial for contempt. Already the court has appointed Attorney General Anwar-ul-Haq as the prosecutor. This amounts to pitting the government’s top legal adviser against the prime minister. The ruling PPP has rightly said that it is a sad day in the history of Pakistan since the serving prime minister has been charged. If one were to look at the case from a different angle, the court’s judgment could be described as a day when democracy touched the greatest height in Pakistan—a country where the judiciary was once party to the rule of the armed forces. Now that the example of Pakistan’s SC is before us, some individuals can approach our Supreme Court to direct the government to bring back the money to India. Here the hurdle of immunity does not come in. The committee which the Indian SC appointed in an earlier case to look into the matter is too slow in processing. Some shock treatment to the government is needed. The writer is a senior Indian journalist. 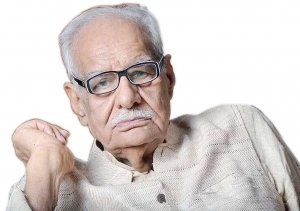 Kuldip Nayar is a veteran Indian journalist, human rights activist and a noted author. It is interesting to note that the will to take action in both the the countries, India and Pakistan is same. Here reluctance, there slow processing by the committee appointed by Indian SC. But the people of both the countries want the money back. Let's see which country takes the lead. Gilani’s defence that Zardari enjoys immunity under the constitution may be all right for legal purposes, although the SC would probe whether immunity is absolute or whether it can be questioned in any way. At least the SC can order that the money stashed abroad be brought back to Pakistan even if it “remains” in Zardari’s account.